Supporters Charters are a joint agreement between clubs/FAs and their fans developing each others rights and obligations in a negotiation/mediation process as a major tool for the establishment of a social dialogue with the overall objective of preventing anti-social fans’ behaviour. A first step is the elaboration of a European Supporters Charter Handbook in consultation of football governing bodies in Europe such as UEFA and the European Professional Football Leagues (EPFL), national associations and leagues, the world players’ union FIFPro and fans’ representatives in Europe. In the end of September the newly established consultation group on Supporters Charters met for the first time at the Millerntor Stadium, home to FC St. Pauli. The group, chaired by FSE, consisting of fans and representatives of European football governing bodies and institutions (e.g. 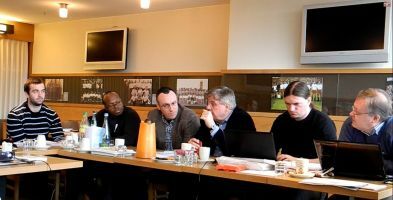 FIFPro, Council of Europe, EPFL, UEFA and a representative of ECA in an observer capacity), came together to kick-off its work to elaborate a European handbook on so-called Supporters Charters. Supporters Charters, in brief, are to be considered a written agreement between fans and clubs identifying each other’s rights and obligations towards each other. Fortunately, there has been a mutual consent between the fans and the representatives of the football bodies and institutions present from the start, that supporters charters shall not be imposed from the top, but in contrast, should be the result of a joint and longer-term negotiation process (on equal footing), and take all local conditions and characteristics into consideration. Existing supporters’ charters which ignored these principles, were considered even counter-productive by all participants with regards to solving existing problems and establishing a functioning fans’ dialogue. The actual handbook, to be published in 5 languages in June 2013, should ultimately provide practical tips for fans, clubs and associations on things to keep in mind while elaborating a supporters charter together, to avoid potential problems, confusions and misunderstandings or even a failure of the project. 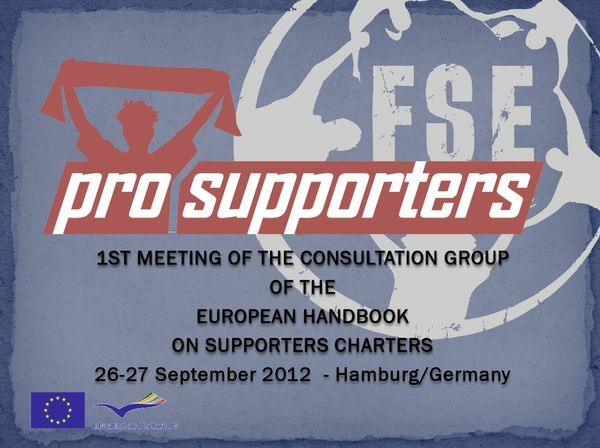 Within the framework of the pro supporters project, FSE wants to create a European handbook on Supporters Charters. In our opinion, contrary to the general belief, a Supporters Charter shouldn´t be a code of conduct, but a negotiated agreement between fans and clubs. In the Supporters Charter, they define their relation and positions towards each other on equal footing. As a result, mutual understanding should be enhanced, as opposed to the often feared creation of more restrictions. That’s why the consultation group that worked on the handbook, which will be published in June 2013, was compiled by a balanced representation of both sides, so of fans representatives and that of different institutions of football across Europe. Many of you may think that the meeting was full of controversies, but: far from it! Even for us at FSE, it was really surprising how much support there was for our definition of supporters charters on both sides. All parties consider it a real chance and a tool for improving the relation between supporters and clubs. You can find more information about Supporter Charters including a short video and interviews on the Football Supporters Europe (FSE) website.